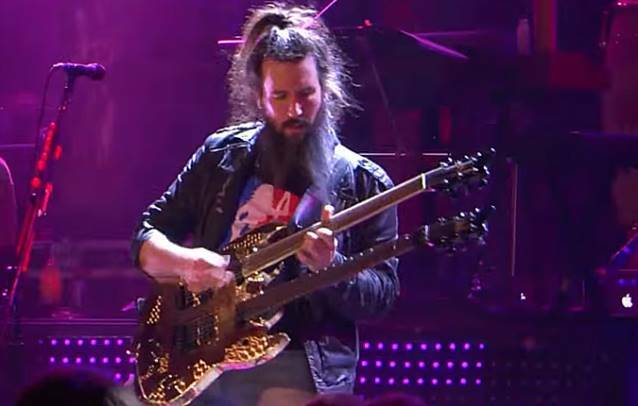 GUNS N' ROSES guitarist Ron "Bumblefoot" Thal has asked fans not to blame the band's management for his inability to clarify his status with the group, explaining that he is "trying to please both sides at the same time that have a different approach to things." Thal responded to one fan via Facebook about the lack of clarity surrounding his position in GUNS N' ROSES. He wrote: "I can't erase a decade of history and I can't stop the media from asking what they want to ask and making up their own titles on their interviews and posts. No matter how much I ask them not to do it." Now, in a new message that was posted at the unofficial GUNS N' ROSES forum MyGNRForum.com, Thal said: "Let folks know I'm not being forced, and TB [Team Brazil, the management company that manages GUNS N' ROSES and Rose] doesn't need to be treated like monsters, and I ask that they not be treated like villains. It's on me, I've been trying to please both sides at the same time that have a different approach to things, and everyone loses a little in the process — that's on me, not them. I hate causing TB and the fans grief, there's just no smooth way to act on two opposing philosophies at the same time, and that's always been difficult for me."